“How is it that you feel so comfortable letting Marco roam in your front yard and neighbors' yards without your watching,” a mom recently asked? I froze, realizing I hadn’t really thought about how we decided to give our six-year-old son so much freedom. Upon reflection, I realized it was an awful lot of incremental adjustments. My wife and I didn’t just wake up when Marco turned six and say, “OK, Marco, it’s time for you to start hanging out in our front yard on your own.” Rather, we started taking steps that led to that from the time he started walking, working almost daily on his independence skills. For example, four years ago we let Marco chase balls down on the sidewalk in front of our house. Sometimes I had to yell and/or chase him down to keep him from endangering himself. However, he learned daily from these experiences, and I’m sure that he became a bit better than other two-year-olds at exhibiting self-control when close to a street. 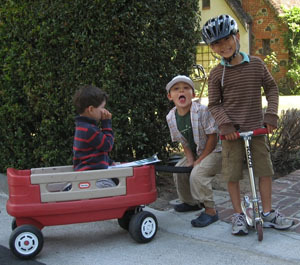 When Marco was three, I took him bike riding on sidewalks. He would go wild on his training-wheels bike, and once again, I had to scream and chase him down quite a bit. Eventually, though, he got pretty good at bike riding. The next year, when he was four, we began to let him play for very short amounts of time in front of our house without our watching. Briefly losing him once, we panicked until we found him behind a bush in our neighbors’ yard. We reprimanded him sharply, and he began to understand how freedom comes with some responsibility. 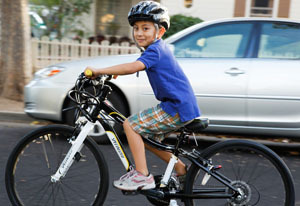 At five, Marco began riding his bike in the street without training wheels. Little by little, I let him ride further and further away from me, and now, he sometimes rides a block or two on his own to a friend's house. Every day, we've kept in mind independence and self-reliance as an ultimate goal for Marco, and every day, he's gotten a little better at being independent. Sure, we've made some mistakes, but these mistakes were never huge because we gave a little more rope every day. I’ll give you an analogy. When you start teaching your children to recognize letters in the hope that they will one day learn to read, you take an incremental approach. Your next step might be to try to get him or her to recognize a few words like “ball.” You don’t wait until they’re six, give them a book, and expect them to read. I can’t bear to think right now of Marco crossing El Camino Real on his bike alone. Likewise, even though he can read some sentences with simple words, I can’t imagine him reading a Harry Potter book on his own. Both will come at the right time if we work toward those goals every day. We’ll get there, together.